Singer and keyboard player Mary Maguire led Lady and the Tramps during a free concert at Sacramento Veterans Hospital, Mather. 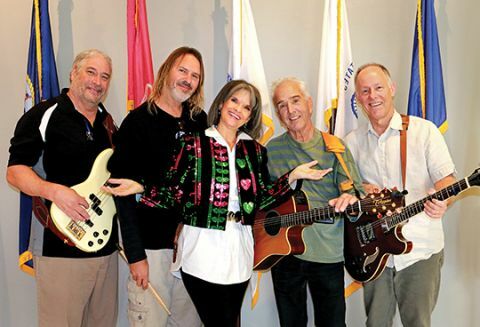 MATHER, CA (MPG) - While hospital visits aren’t often music for outpatient ears, veterans recently enjoyed three hours of classic rock at Sacramento VA Medical Center, Mather. Sponsored by the Home of the Campaign, the event continued veteran week celebrations with free 340 pizza lunches, tee shirts and patient visits. Volunteers from Hewlett Packard Enterprise led a volunteer force for the outreach. Lady and the Tramps’ concert was originally planned for outdoors but poor air quality nudged activities into the hospital lobby. Unfazed, the group performed classic rock tunes for a mobile but appreciative audience. Home of the Brave was Established in 2012 by Hewlett Packard employees in in Houston TX and Herndon VA. The group later partnered with Veterans Affairs Voluntary Service; the VA Homeless Program and Soldiers Angels. Corporate contributors include Perspecta, Bristol-Myers Squibb and Micro Focus. The campaign’s mission to honor and support veterans has created giving events all over America, with volunteer activities such as patient visits at health centers. Fundraising and sponsor donations provide hats, blankets, water bottles and backpacks to thousands of veterans in 42 states, and in Washington DC and Puerto Rico.